In early March I was walking down Shijo Dori, one of Kyoto’s main east-west thoroughfares, on my way to visit my friend at his tea house in Gion Kobu. It was 3:30 p.m. and Shijo was crowded with tourists. As I approached the intersection of Shijo-Hanamikoji, I saw a maiko on the opposite side of the street. The maiko slipped into the dark alcove of a building and stepped behind a sign. None of the crowd at the intersection noticed this maiko hiding in plain sight directly behind them. “She’s clever,” I thought to myself. The maiko was too far away and too obscured by the streaming line of pedestrians for me to identify, but from her height and actions, I thought it was my favorite maiko at the moment, a maiko I have been photographing for 2 years. I turned right onto Hanamikoji, passed the crowds milling in front of Ichiriki, the famous teahouse, and stopped to wait for the maiko in a quiet area. If it was not the maiko I thought it was, I was just going to walk on. If it was the maiko I know, I wanted to talk to her. I felt I owed her an explanation because I cancelled our photo session at the end of January. I contracted a really bad case of influenza, which turned into vertigo. I was as sick as I had ever been for 2 weeks. I’m sure my friend told the maiko’s okasan the reason why I had to cancel, but I doubted very much if the okasan had told the maiko. I’ve learned through the years that little information is shared with maiko about their engagements. One maiko I photographed came to our first photo session without even knowing she was going to be photographed. No one at her okiya had told her. She panicked because she didn’t feel her hair looked good enough. It only took a few minutes to assure her that she looked fine, but I realized that sometimes even basic information is not passed on. I was standing a fair distance from the busy intersection, still waiting to see if the maiko was the young woman I wanted to talk to. I saw the maiko burst through the pack of people crossing the street. She trotted, her eyes fixed on the pavement and her shoulders hunched inward to make herself as inconspicuous as possible. It was the maiko I know. I called her name softly. The maiko was so intent on looking down that she didn’t notice me, and I’m so tall that in Japan I’m pretty hard to miss. She was approaching quickly, and I called her name again, a bit louder. She still didn’t notice me. As she passed me, I said her name a third time, louder still. The maiko looked up at me, startled, her shoulders tensed. I could almost see her breath a sigh of relief when she recognized me, and her shoulders relaxed. “John-san!” she said. I explained to the maiko about my influenza as we walked, and I told her I would be photographing her again in May. Suddenly, the maiko got very serious. “John-san, I’m very sorry for my scared face.” She thought she had offended me when I greeted her. This is one of the reasons I like this maiko so much. She’s very honest and sincere. Of course, as far as I was concerned, she had nothing to apologize for. I hadn’t even noticed her “scared face,” as she put it. I often get lost in thought when I walk, and I startle easily. I didn’t even think about it. The maiko and I turned left onto Aoyagi-koji, and my friend was waiting for me in front of the tea house. He waved to us. The maiko and I stopped to chat with him. We talked for a few minutes, asking her about rehearsals for Miyako Odori and other everyday things. I repeated that she didn’t need to apologize, but I wasn’t sure I convinced her. I went with my friend into the “home bar” of his tea house, and I completely forgot about my conversation with the maiko. It wasn’t until later that evening, while I was walking home, lost in thought as I often am, that I realized the maiko had mentioned her “scared face” twice and was really concerned that she had offended me, even though she hadn’t. And it hit me. If maiko today are so tense and stressed while they are out in public that they are so easily startled by someone they know pretty well, how must they feel when a complete stranger comes up to them? 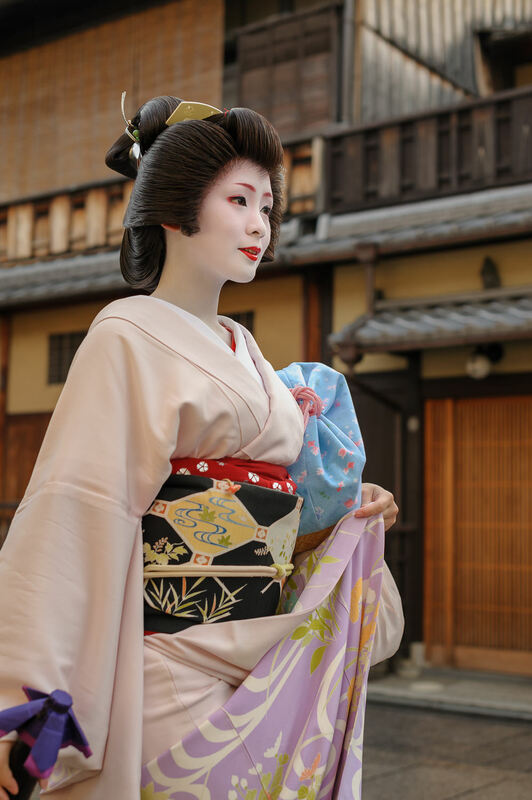 I know I am more aware and mindful of the feelings of the maiko and geiko I know when I see them on the streets of Gion or Miyagawa-cho or Ponto-cho, and if you come to Kyoto and see a maiko or geiko when they are out and about, I hope you will be, too.